China opened a busy final month of its 2016 launch manifest with the Dec. 10 liftoff of a Long March 3B booster carrying the Fengyun-4A weather satellite. The rocket leapt skyward at 11:11 a.m. EST (16:11 GMT) from the LA-3 launch pad at the Xichang Satellite Launch Center in China’s Sichuan province. Very little information was released by Chinese media about pre-launch preparation as well as the launch itself. It was revealed the Fengyun-4A satellite arrived at Xichang on Oct. 23. Next, engineers conducted fit checks and initial tests of the spacecraft, which was followed by the assembly of the Long March 3B rocket. The launcher, powered by its core stage equipped with a quartet of YF-21C engines and four strap-on boosters fitted with one YF-25 motor each, commenced a short vertical climb after liftoff. After few seconds of ascent, the launch vehicle performed a pitch and roll maneuver and turned southeasterly to begin flying over the Pacific Ocean. The boosters provided additional thrust for the first two minutes and 20 seconds of flight before they were jettisoned. Afterward, the rocket continued to accelerate by its core stage alone for only 18 seconds, completing the burnout of its YF-21C engines at 2 minutes and 38 seconds. Shortly after, the core stage was detached from the launch vehicle and the second stage assumed control over the mission by igniting its DaFY-20-1 main engine. This phase of the flight lasted nearly three minutes, during which time the payload fairing was discarded and ended in separation of the second stage about five-and-a-half minutes after launch. After the release of the second stage, the longest part of the flight started. The third stage conducted two burns of its two YF-75 engines. The 20-minute long phase of the mission was completed some 26 minutes after liftoff when the satellite was successfully injected into an elliptical geostationary transfer orbit (GTO). Weighing about 5.3 metric tons, Fengyun-4A is an advanced meteorological satellite built by Shanghai Academy of Spaceflight Technology (SAST). It is a three-axis-stabilized spacecraft based on the SAST-5000 bus, which features two deployable power-generating solar arrays. The spacecraft is designed to be operational for five years. The satellite’s main instrument is the Advanced Geosynchronous Radiation Imager (AGRI), capable of capturing a full view of Earth every 15 minutes in 16 spectral channels for Earth surface monitoring and cloud observation at a resolution between 0.5 and 4 kilometers. 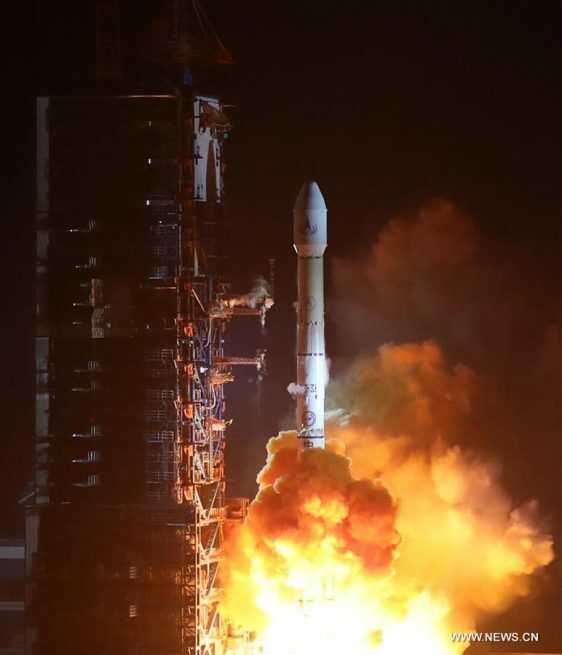 Another camera on board Fengyun-4A is the Lightning Mapping Imager (LMI) – the first lightning detection sensor on any of China’s satellites. It will be used to observe regional lightning activity in the country. Besides the two imagers, the satellite is fitted with the Geostationary Interferometric Infrared Sounder (GIIRS), developed to monitor and measure internal constitution and precipitation parameters of the atmosphere cloud cluster. The spacecraft also hosts the Space Environment Monitoring Instrument Package (SEMIP). It is a package of instruments for energetic particle detectors. It will monitor charged particles at platform level. Fengyun-4A will be operated by China Meteorological Administration. The satellite will be used to take multiple spectral band measurements of high temporal resolution and accuracy to obtain imagery of the Earth’s surface and clouds. The First satellite in the series, Fengyun-1A, was launched in 1988. The Fengyun-4 satellites are expected to replace Fengyun-2 satellites, which have been operating since 1997. Compared to Fengyun-2, the fourth generation of these weather spacecraft have been considerably improved in terms of the amount of data, network transmission bandwidth, product type and quantity, and archiving data and applications. China’s National Space Infrastructure Plan envisions six more Fengyun-4 spacecraft to be orbited by 2033. The next Fengyun-4 satellite (4B) is scheduled to fly spaceward in 2018. The three-stage Long March 3B rocket used in Saturday’s flight is 180 feet (55 meters) tall and capable of launching up to 12 metric tons of payload to low-Earth orbit or 5 metric tons of cargo to a geostationary transfer orbit (GTO). The 3B/E version that was employed for the mission is an enhanced variant of the rocket. It featured an enlarged first stage and boosters. This version was brought into service in 2007 to increase the rocket’s GTO cargo capacity and lift heavier GEO communications satellites. Saturday’s mission was the 242nd flight of the Long March rocket series and the 37th flight overall for the 3B version. It’s also the 7th launch from Xichang this year. December is expected to be a busy month for China’s launch manifest as the country plans four more space missions before year-end. The next liftoff is planned to be conducted on Dec. 19. On that day a Long March 2D booster will send the TanSat Earth-observing satellite into orbit.